Magento extensions are the combination of functions that can be added to any Magento store to enhance its functionality. If you are looking for the general setup and the initial steps on how to create Magento extension – this section is formed for your help. Also, we’ve covered the question of how to work with databases and set up the cron job. Below you can find frequently asked questions and solutions for each of them. What is Magento 2 Marketplace? This source is designed for easy discovery of relevant Magento extensions. It provides a curated user experience with offerings from top brands and new innovators. Discover new and customized functionality, in key business categories, to help your business thrive. So, how to install, create and uninstall any extension from your Magento store, you can find below. How to Install Extension for Magento 2 in Localhost? Step 1: Download/Purchase the extension. Step 4: Disable the cache. Step 5: Run the command. Step 6: Find your extension installed. After opening Stores­ >>Configuration >­>Advanced >­> Admin, the module will be shown in the admin panel or, you can find your extension on list modules that are displayed in command line after step 5. How to Create Custom Extension in Magento? Step 1. Disable Magento cache (recommended). The easiest way to disable cache is to go to Admin >> System >> Cache Management >> select all cache types and disable them. Step 2. Put Magento into a developer mode (recommended). Step 3. Create the folder of Hello World module. Name of the module is defined as “VendorName_ModuleName”. 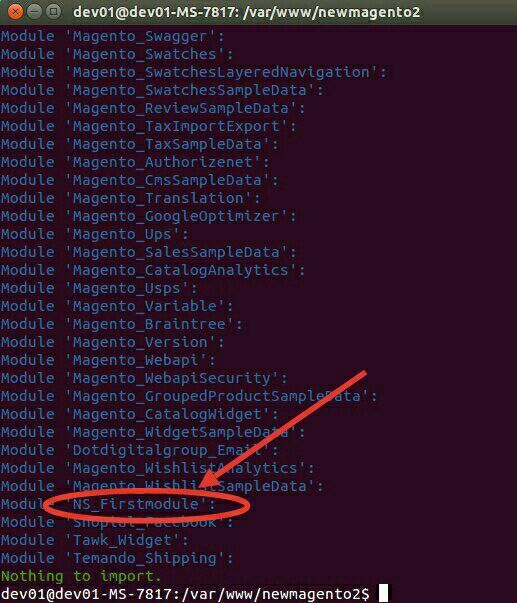 The first part is the name of the vendor and the last part is the name of the module: For example Magento_HelloWorld. Step 4. Create etc/module.xml file. Step 6. Enable the module. Finish the step 5, we have already created Firstmodule. And we will enable this module in this step. Step 7. Creating a controller. 7.1. First, we need to define the router. After finish all steps, the output Hello! It’s my first module of Magento 2! should be displayed in your browser when you open the URL. How to Uninstall Magento 2 Extension? Next, we move on to work with a database and set up the cron job. Go to your store core folder and open the env.php file under the app/etc folder. Find the next code, where database_name is the actual database name which you use for your Magento 2 store. How to Change Database Name in Magento? That’s how you change Magento database name. How to Setup Cron Job in Magento 2? Magento 2 Cron job may be set up by module file etc/crontab.xml, that will have such content. Class Web4pro\Download\Model\Cron should exist and implement method execute, that will run when cron job starts.